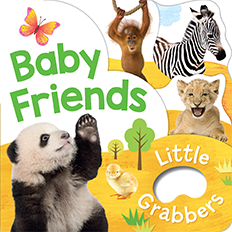 Each of these four beautiful light-weight foam-tabbed books has a die-cut handle for your baby to grab. 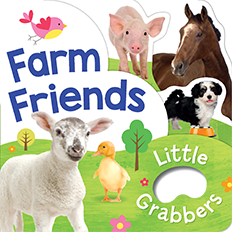 Each book is illustrated with a mix of photography and artwork to present familiar objects to your child in new and exciting panoramas. 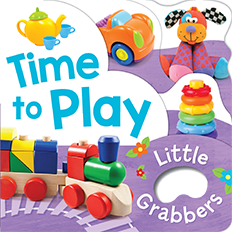 Your baby is bound to fall in love with Little Grabbers. These books are also available in conventional board. A book for baby to grab and hold. Fun photographs and illustrations show cute baby animals – spotted, striped short and tall. A book for baby to grab and hold. Fun photographs and illustrations show cute farm animals – spotted, striped short and tall. A book for baby to grab and hold. Fun photographs and illustrations show everyday objects. 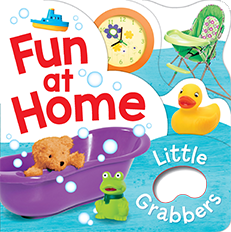 What fun things can we do at home? A book for baby to grab and hold. Fun photographs and illustrations show fun toys. Let’s play! A festive book for baby to grab and hold. What will baby see and play with during their first Christmas? 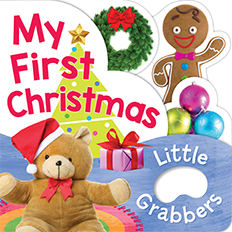 A festive book for baby to grab and hold. 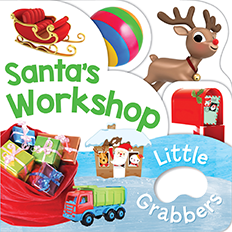 What will baby see and play with at Santa’s Workshop?